The news will show you large groups of men chasing frantically after lorries as they enter the port area of Ouistreham. What isn’t shown are the men themselves. The men who range from calm, peaceful to tired. But oh so welcoming. 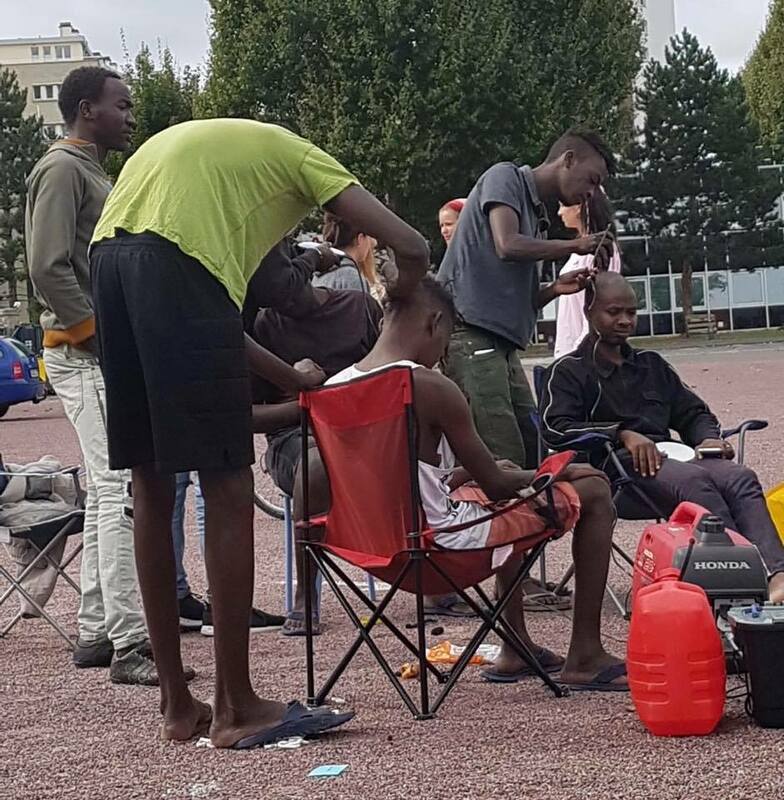 Care4Calais were able to visit Ouistreham and Caen recently to see the current situation for ourselves and distribute some essentials. Arriving near the marine, large groups of men formed, all from Sudan. But bound by a real sense of community despite hopelessness amongst many. The group were incredibly grateful for being able to receive either a pair of warm joggers, sturdy shoes or a basic phone which is the best we have. The usage of our charging boards, Jangala WIFI box and hairdressing set was welcome by all and we stayed until nightfall so all could get the most they could. We value our donations and services all the time, especially in moments like these when we are able to give them to groups of people who really are somewhat forgotten by many. A small insight into distributions with Care4Calais, often we have to keep a close eye on our hair set as hair clippers are sometimes lost of misplaced as they are a high price item. During our visit to Caen and Oustrehaim, due to limited volunteer numbers and large numbers, we left our hardiressing set unattended whilst we distributed donations. When the team returned back to the area, the full set was intact as men carried on quietly cutting each other’s hair and shaping up their stubble or beards. The News will show you these men in a way to criminalise them, to instil fear in you. To see the backs of bodies running frantically to lorries. But the news doesn’t show you the faces of these men, nor will it share the stories of kindness, gratitude, personality. The situation is stark. The numbers are growing. But please remember these men need help too.